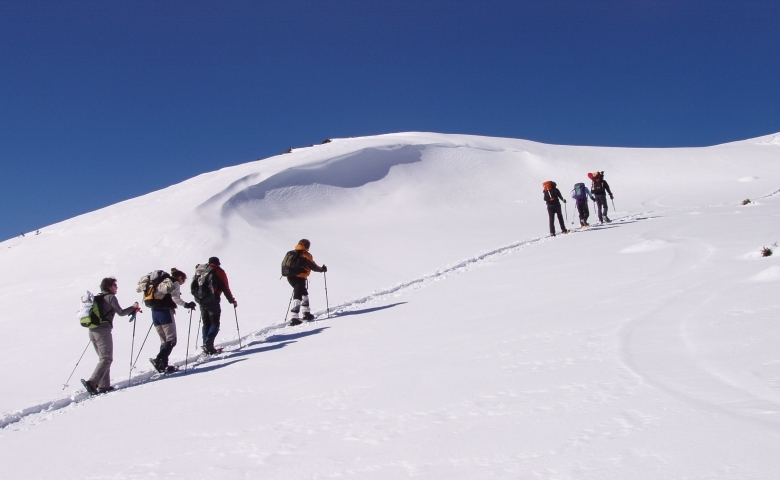 A guided snowshoeing holiday is quite simply one of the most environmentally friendly experiences you can have in winter time. 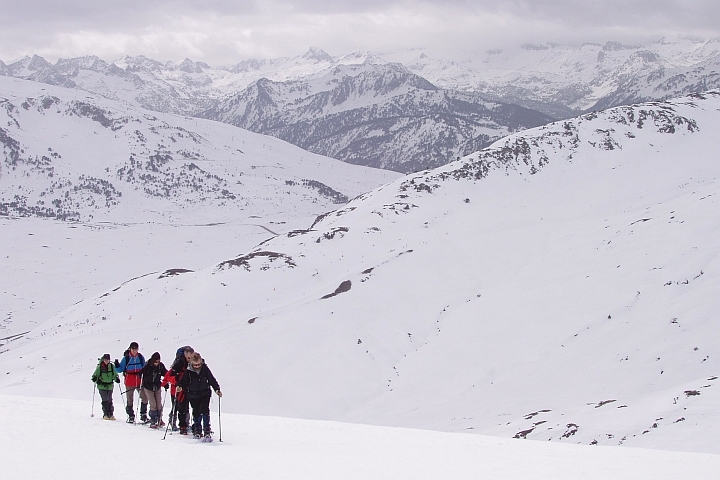 It is also one of the best ways to explore the beautiful and wild mountain environment of the Pyrenees at this spectacular time of year. 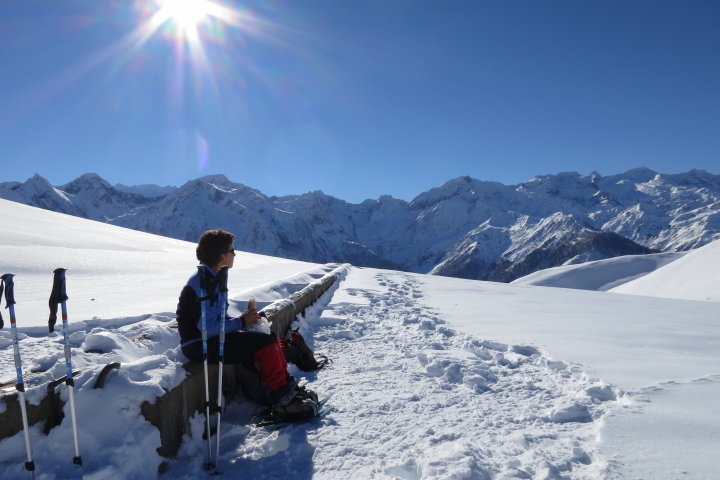 What can I expect from this snowshoeing holiday? 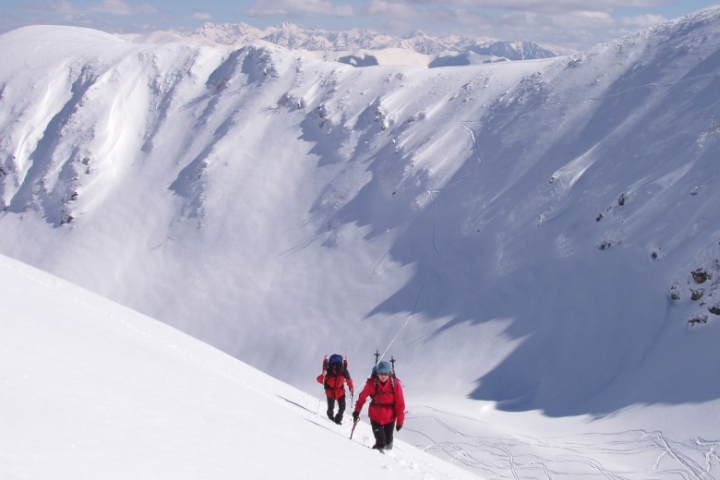 This week long snowshoeing adventure holiday includes 5 days of snowshoeing fun. Your experienced local guides know just where to go to take you off the regular tourist routes, keeping any path erosion and environmental impact to a minimum. 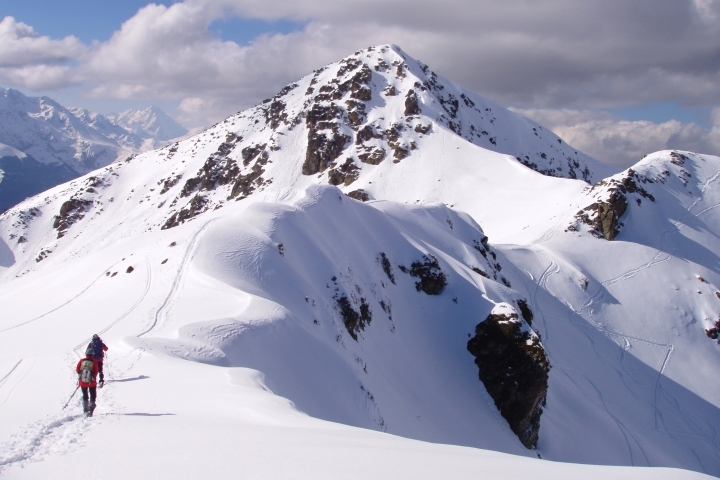 You’ll discover and identify animal tracks left in the snow – red deer, roe deer, wild boar, chamois, foxes and maybe, just maybe, some signs of the brown bear looking for food! Look to the skies and you may be lucky enough to spot the bearded vulture which also frequents these parts. 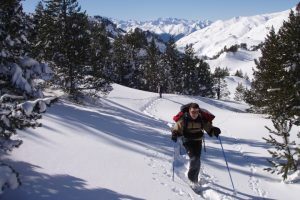 You’ll snowshoe alongside rivers in unspoilt valleys, up gentle slopes and past mountain cabanes to spectacular cols which afford far-reaching views of the Pyrenees mountain range. 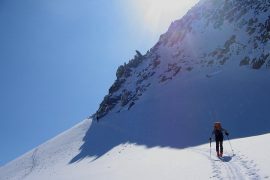 Is this snowshoeing holiday for me? This guided snowshoeing holiday is for those who want to get away from the crowds of the traditional ski resorts and discover a true off the beaten track winter wilderness. 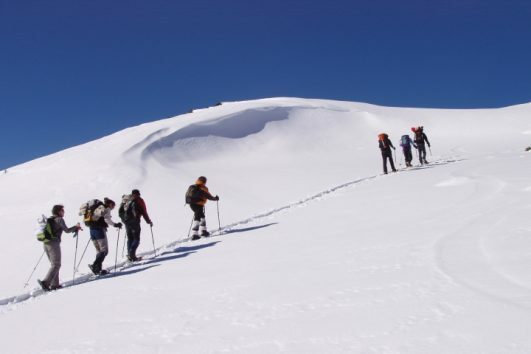 If you are a regular hill walker who’d love to explore a pristine mountain environment in winter time then this holiday will suit you down to the ground. 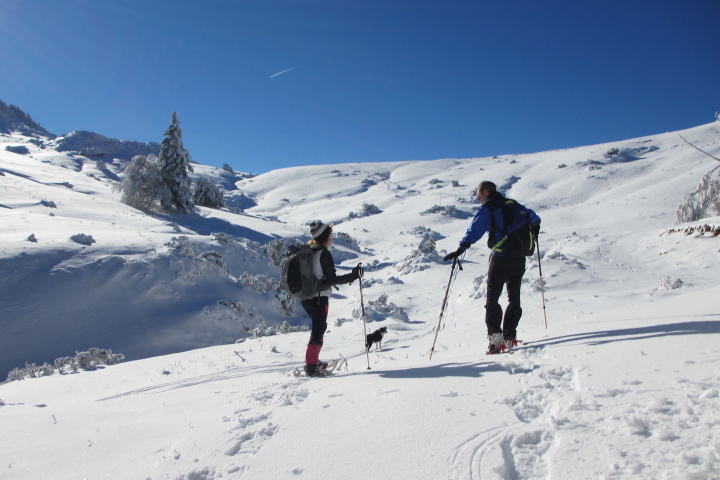 Before you book your snowshoeing holiday, do check out our hot snowshoeing advice for tips and tricks to ensure you have the best time on your Pyrenees winter holiday. Your base for this snowshoeing holiday is the Hotel Aquitaine, a great value 2* hotel in Bagneres-de-Luchon. 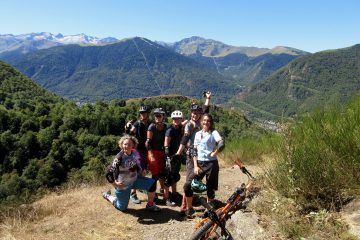 The hotel is located opposite Luchon’s well-being centre in which the Vaporarium is located. 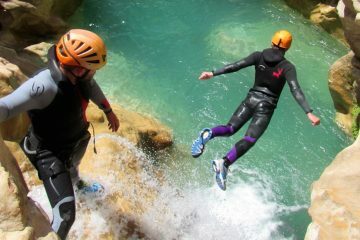 The Vaporarium is Europe’s only natural hammam. 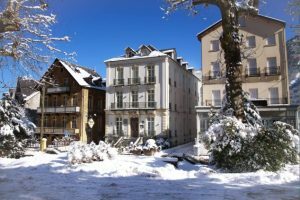 It is comprised of a series of underground galleries in which the earth’s natural thermal energy has created an environment that has 100% humidity and temperatures of up to 42 deg C.
The hotel is in a quiet position just a few minutes walk from Luchon town centre. Everything is clean and light and bright here and the owner takes great pride in the quality of his establishment. All bedrooms have en suite bathroom facilities with a shower and toilet and TV. Some are oriented towards the mountains or face the thermal park.